Toowoomba is the gateway to the Surat Basin and Darling Downs region located in south-east Queensland, only 125km from Brisbane. As one of Australia’s largest inland regional cities and Queensland’s number one agricultural region, Toowoomba is ideally situated to hold the “Ag in the Asian Century Conference” for the second year in a row. Key agricultural outputs for the Toowoomba region include grain, cotton, beef, dairy products, pork and chickens, along with a growing number of horticulture products. The agriculture sector alone generated an output of approximately $1.35 billion in 2014, and employed thousands, making Toowoomba one of Australia’s leading powerhouse agricultural producing regions. Recent times have seen the region experience unprecedented private and government investment in major billion dollar infrastructure projects. History was made in November 2014 when Toowoomba's privately built, internationally capable airport – Brisbane West Wellcamp Airport opened its doors. With the booming economic and population growth in Asia and their increased demand for high quality, clean, green and safe produce, Australia has had to rapidly reconsider the supply chain for packaged and fresh food into this region. The opening of Wellcamp Airport, along with the long anticipated construction of the Toowoomba Second Range Crossing and the proposed Melbourne to Brisbane Inland Rail Project, global export opportunities for businesses working in the agriculture sector are set to significantly open up, establishing Toowoomba as a natural Inland Port. Toowoomba is already recognised as a service centre and commercial hub for the Surat Basin and Darling Downs. The Surat Basin encompasses a geographic area from Toowoomba in the east, to Roma in the west, north to Taroom and south to the New South Wales border, hosting a rich resource sector worth $5 billion to the Toowoomba, Western Downs and Maranoa regions in 2013-2014. Although the resource sector has experienced a downturn in the last 6-12 months due to Coal Seam Gas projects transition from the construction to the operational phase, the industry is still expected to continue for the next 20-50 years, employing thousands of people. Situated 700 meters above sea level, Toowoomba has a temperate climate ranging from a mean minimum temperature of 5.3°C in winter, to a mean maximum of 27.6°C in summer. Often referred to as ‘The Garden City’, Toowoomba is a beautiful place, filled with tree-lined streets and multiple award-winning gardens and parks that, each spring, attract more than 100,000 visitors to the Carnival of Flowers. Toowoomba is Australia’s number four (and Queensland’s number one) friendliest city and the fifth most affordable place to live in Australia. In recent years it has been rated as the hottest investment location in Australia by a leading property and investment report, which has resulted in the current population of 161,970 to be projected to grow to 230,000 by 2031. The heritage listed Empire Theatre boasts the latest purpose-built facilities, while still retaining the grandeur and superb acoustics of the original building opened over 100 years ago in 1911 as “Empire Pictures”. Over the years the venue has been rebuilt and restored yet without losing its charm or its profound effect on locals and visitors alike. 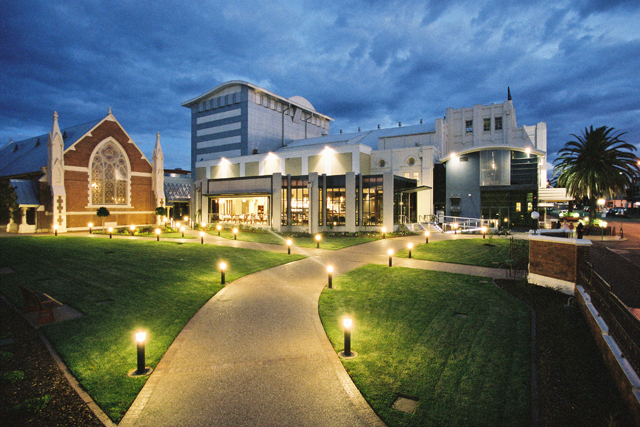 The recent development of the Toowoomba Regional Arts and Community Centre (TRACC) complements the existing Empire Theatre and Empire Church Theatre, with the 2014 “Ag in the Asian Century Conference” one of the first functions to be held in the venue. TSBE is excited to be utilising this space for the second year in a row.